The name Marik, means “warlike”, and that meaning has always been so fitting for my brave and powerful son. Marik’s life began with struggle, he was born with Bilateral Severe hearing impairment. He struggled with speech, learning, school, and socially as well. He always fought hard to fit in, and be a strong little boy that let nothing stand in his way. He barreled through any obstacle that was thrown his way. He, none of us for that matter, knew the epic battle he was about to endure. On June 12, 2012, I took Marik and his younger sister to the pool on a hot Louisiana southern day. While I lounged in the shade, “warlike” Marik took the swim test and proved to the lifeguards that he was capable enough for his favorite thing, the diving board. He did front flips, back flips, cannon balls, and side twists. I lost count of how many times that he flew off that diving board at 100 miles an hour. After a few minutes, he emerged from the water and was limping. His face was a bit pale, and he asked to go home. Once home, we placed him on crutches and decided to watch the injury. 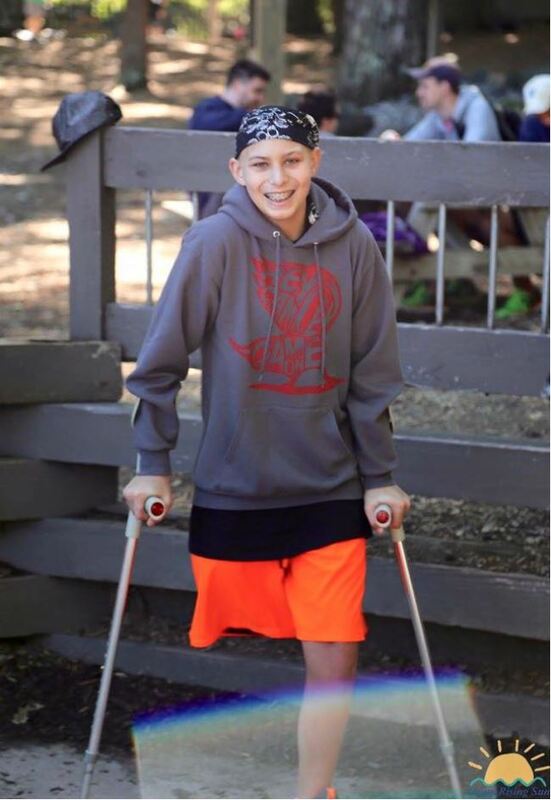 After all, as a healthy and very active 9 year old, we were familiar with crutches! Also at that very time, we were transitioning our whole family from Louisiana to Connecticut, following Navy orders. We made it to Connecticut on June 29, 2012. Marik’s right leg however was continuing to plaque him. He would feel better, then the pain would return with a vengeance. Upon arriving in Connecticut, we took him to the ER at Naval Subase New London where an x-ray was performed. There was indeed a small fracture, but something else concerned the doctor. A “shadow” seemed to loom around the area of the fracture. We were immediately given a referral to see an Orthopedic Specialist. The specialist, upon looking at Marik’s x-ray, proposed an MRI, CT, and bone scan. All three were performed, and we were told to wait for the results. A few days later we received a call from them requesting we see a Pediatric Orthopedic Oncologist at Yale. We were told not to worry, it was just a precaution. We quickly scheduled that visit, where on August 1, 2012 Marik underwent a bone biopsy. The results from that biopsy were as we had hoped, not cancer, but an Anuerysmal bone cyst. Troubling, but certainly not life threatening. Surgery was scheduled for August 14, 2012. The next few days were a whirlwind of faces and places. On August 22, Marik’s first port was placed. His leg was casted from the groin down to the toes, and an intense protocol of chemotherapy was started. We were told that in 12 weeks, we would know what type of surgery Marik would need. Unfortunately, Marik’s tumor was very large and aggressive, and continued to grow with treatment. We made the heart wrenching decision to amputate his right leg. On November 27, 2012 we did just that. Marik continued with chemotherapy until June 2013 when his protocol ended, and he was declared NED. The struggles however didn’t stop there. Marik had a hard time adjusting to his prosthetic leg, and has had 7 to date. In November 2013, he underwent a very painful surgery to revise his amputation. He has struggled with depression, anxiety, PTSD. He missed his entire 4th grade year of school, and was falling even further behind. Then, during routine scans on June 21, 2016 a large tumor was found in Marik’s left lower lung. On July 7, 2016 he had thoracic surgery to remove the mass and on July 12, 2016 the tumor pathology came back as Recurrent Osteosarcoma. Shattering, crushing news. He now had another long road of chemotherapy ahead of him. Six months later in January 2017, Marik was again declared cancer free. That news however, wouldn’t last long. In June 2017, yet another tumor was found in Marik’s lung. On July 17, 2017 he again underwent thoracic surgery to remove the newer, larger tumor. After a failed attempt on an oral chemotherapy drug, the future seems unclear. We will not give up, we will continue to fight, but we are tired. Marik is tired. During the last five years, there is one thing that has been abundantly clear, it takes a village. Mentally, emotionally, financially, we couldn’t have survived without help. Melissa and The Dorian J. Murray Foundation have done just that. From a grant to help with our mortgage, finding a kind soul to care for our yard, or a tearful dinner, Melissa and the Foundation have been a huge support. She has a unique insight that can see into the soul of a struggling family, and a heart that wants to help. We will continue our fight, and with amazing people like this behind us, it’s hard to believe we can lose.